Whilst John saw the sacred mystery, Michael the Archangel sounded the trumpet: Pardon us, O Lord our God, who openest the book, and breakest the seals. Alleluia. May 7, 8, 9, 2018: Rogation Days (Lesser Litanies). Holy Church tells us of the glories of St. Michael in several portions of the Liturgy; but particularly in the following Responsory and Antiphons, taken from to-day's Office. *He repays, by blessings, the honour shown him by the Faithful; and his prayer leads us to the kingdom of heaven, alleluia. ℣. The Archangel Michael is set over Paradise, and is honoured by the citizens of heaven. Ant. The Archangel Michael came with a multitude of Angels; God confided unto him the souls of the Saints, that he might lead them to the Paradise of bliss, alleluia. Ant. Michael the Archangel came unto the aid of God's people; he stood as a help to the souls of the just, alleluia. Ant. O most glorious Prince! Michael the Archangel! be mindful of us: here and in all places, ever pray for us to the Son of God. Alleluia, alleluia. O God, who, by a wonderful order, hast regulated the employments of Angels and men; grant that those who are always ministering before thee in heaven, may defend our lives here on earth. Through our Lord Jesus Christ, Thy Son, who liveth and reigneth with Thee, in unity of the Holy Ghost, God, World without end. Amen. David foretold that the Emmanuel's coming into this world would be greeted by the Angels, and that they would humbly adore him on his first appearing among us. (Ps, xcvi. 8; Heb, i. 6) We saw this prophecy fulfilled on the Night ever blessed, when Mary brought forth the Fruit of her womb. The Angelic choirs sang one of their heavenly hymns, which led the Shepherds to the Stable; we blended our songs with theirs, in homage to our Infant-God. The Resurrection of our Emmanuel was sure to be honoured by the presence of these blessed Spirits, who had witnessed, with amazement and trembling, the humiliations and cruelties of his Passion. The moment he passed through the barrier that imprisoned him in his Sepulchre, an Angel, with a face beaming as the sun, and garments white as snow, came and rolled back the Stone, and proclaimed to the holy Women, that He whom they were seeking had risen. When they entered the cave of the Sepulchre, two other Angels, clad in white robes, appeared to them, and repeated the tidings of Jesus' triumph. Let us reverently honour these princely heralds of our deliverance, and consider how respectfully they cluster round Jesus their King and God, during the forty days after his Resurrection. They adore this glorified Humanity, which they are soon to see raised up to the highest heavens, and throned at the Father's right hand. They rejoice with us in the happiness brought to us by this Paschal Feast, which restores immortality to us in the person of our Risen Saviour; and thus, as St. Gregory told us a few days back, “it is the Feast of the Angels, because, by its recalling us to heaven, it fills up their number.” It was but right, therefore, that Paschal Time should devote one of its days to honouring the Angelic Spirits. (One day) previous to the Annunciation, we kept the feast of St. Gabriel, our Lady's honoured messenger; to-day, it is St. Michael, the Archangel and Prince of the heavenly host, that is to receive our love and praise. He himself selected this day, by appearing on it, and leaving us a pledge of his presence and protection. The very name of Michael urges us to honour this glorious Spirit; it is a cry of enthusiasm and fidelity, for it signifies: “Who is like unto God?” Satan trembles at hearing this name, for it reminds him of the noble protest wherewith the bright Archangel answered the call of the rebel angels. Michael proved his strength and prowess when he fought the great battle in heaven. On that account, he was made the Guardian and Protector of God's people;—of the Jews first, and afterwards, of the Christian Church, for the Synagogue forfeited all her honours. Michael now watches over Jesus' Spouse, our mother; he supports her in her trials, and she wins no triumph in which he has not had some hand. But, we are not to suppose, that the holy Archangel is so engaged in looking after the general interests of Christ's kingdom on earth, that he cannot attend to the prayers of each individual member of the Church. God has given him a compassionate love for men; and there is not a single soul that escapes his notice. He wields the sword in defence of the Spouse of Christ; he wars with the dragon, who is ever lying in wait for the Woman and her Child (Apoc, xii. 13);—but, at the same time, he is attentive to each one of us; for, after having confessed our sins to Almighty God, and to the Blessed Mary ever a Virgin, we acknowledge them likewise to Blessed Michael the Archangel, and beseech him to pray for us to the Lord our God. He assists at every death-bed, for his special office is to receive the souls of the elect, on their quitting the flesh. He, with loving solicitude and princely bearing, presents them to the Light Eternal, and introduces them into the House of God's glory. It is holy Church herself that tells us, in the words of her Liturgy, of these prerogatives of the great Archangel. She teaches us, that he has been set over Paradise, and that God has given him the charge of leading to heaven the souls of them that are to be received there. On the Last Day, when our Risen Jesus is to appear on the clouds of heaven to judge mankind, Michael will have to fulfil a ministry of awful import;—he, with the rest of the Angels, will have to separate the good from the bad, all of whom will then have resumed their bodies in the general resurrection. Our Catholic Forefathers, in the Middle Ages, were fond of representing the holy Archangel engaged in this dread function. They put him standing at the foot of Jesus' judgment-seat, and holding a scale, in which he is weighing the souls of men and their works. Devotion to St. Michael was sure to spread through the Church, especially after the worship of idols had been banished from the various countries, and men were no longer tempted to give divine honour to creatures. Constantine built in honour of the great Archangel a celebrated Church called Michaëlion; and at the time of Constantinople's falling under the power of the Turks, there were no less than fifteen Churches that bore the name of Saint Michael, either in the City or the suburbs. In other parts of Christendom, this devotion took root only by degrees; and it was by the holy Archangel's appearing to men, that the Faithful were prompted to have recourse to him. These apparitions were local, and for reasons which to us might seem of secondary importance: but God, who, from little causes, produces great effects, made use of them whereby to excite Christians to have confidence in their heavenly protector. The Greeks celebrate the apparition that took place at Chone, the ancient Colossa, in Phrygia. There was, in that city, a Church dedicated to St. Michael, and it was frequently visited by a holy man, named Archippus, who was violently persecuted by the pagans. One day, when Archippus was at his devotions in his favourite St. Michael's, his enemies resolved to destroy both him and the Church. Hard by, ran a brook which flowed into the river Lycus: this they turned off, and flooded the ground on which stood the Church. Suddenly, there appeared the Archangel St. Michael, holding a rod in his hand: the water immediately receded, and flowed into a deep gulf, near Colossa, where the Lycus empties itself and disappears. The date of this apparition is not certain, beyond its having occurred at the period when the pagans were numerous enough in Colossa to harass the Christians. Another apparition, which encouraged devotion to St. Michael in Italy, took place on Mount Gargano, in Apulia; it is the one honoured by to-day's feast. A third happened on Mount Tomba, on the coast of Normandy: we will commemorate it on the 16th October. The feast we are keeping to-day is not so solemn as the one of September 29th; it is, however, more exclusively in honour of St. Michael, inasmuch as the Autumn Feast includes all the choirs of the Angelic hierarchy. The Roman Breviary gives us the following account of the apparition on Mount Gargano. That the blessed Archangel Michael has often appeared to men, is attested both by the authority of sacred Scripture, and by the ancient tradition of the Saints. Hence, the memory of these apparitions is commemorated in divers places. As, heretofore, Michael was honoured by the Synagogue of the Jews as Guardian and Patron, so is he now by the Church of God. 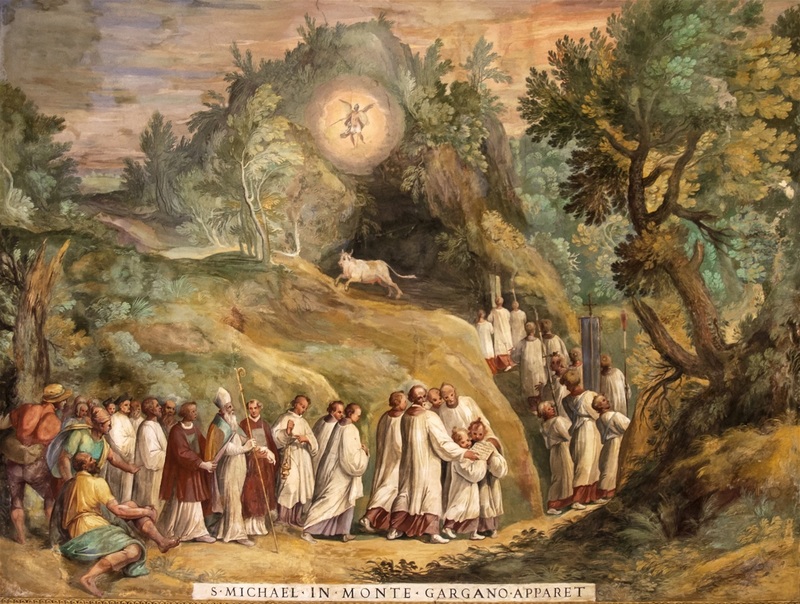 A celebrated apparition of the Archangel took place, under the pontificate of Gelasius 1st, in Apulia, on the top of Mount Gargano, at whose foot lies the town of Siponto. A bull, belonging to a man who lived on the mountain, having strayed from the herd, was, after much searching, found hemmed fast in the mouth of a cave. One of its pursuers shot an arrow, with a view to rouse the animal by a wound; but the arrow rebounding, struck him that had sent it. This circumstance excited so much fear in the by-standers and in them that heard of it, that no one dared to go near the cave. The inhabitants of Siponto, therefore, consulted the Bishop; who answered, that in order to know God's will, they must spend three days in fasting and prayer. At the end of the three days, the Archangel Michael intimated to the Bishop, that the place was under his protection, and that what had occurred was an indication of his will that God should be worshipped there, in honour of himself and the Angels. Whereupon, the Bishop repaired to the cave, together with his people. They found it like a Church in shape, and began to use it for the celebration of the divine service. Many miracles were afterwards wrought there. Not long after, Pope Boniface dedicated a Church in honour of St. Michael, in the great Circus of Rome, on the third of the Kalends of October (September 29th), the day on which the Church celebrates the memory of all the Angels. But to-day's feast is kept in commemoration of the apparition of Michael the Archangel. The following Sequence is from the collection of the Monastery of Saint Gall, and was composed by the Monk Notker, in the eleventh century. O King of heaven! in thy praise, may our whole assembly and choir now sound forth its instruments of sweet music, and sing its hymns to thee. For this is the day of Michael's most glorious feast, which gladdens the whole earth with beautiful joy. Thou dividest the Angels created by thee, into nine choirs; yet do they all thy bidding, when thou wiliest to demand angelic service. They were the first creatures of thy hands; whereas we are thy last; yet were we made to thine image. This triple division of the heavenly Spirits, according to their special offices, reveals to us the mysterious design of God. First comes the Angelic army; then the phalanx of Archangels; then the host of the Principalities. After these, follow the heavenly Virtues, the sweet-sounding Powers, the spiritual Dominations, the Thrones divine, the ethereal Cherubim, the burning Seraphim. O Michael, Prince of the heavenly court! Gabriel, messenger of the Incarnate Word! Raphael, our guide through life! lead us to the company of the citizens of Paradise. By you are fulfilled all the biddings of the Father, the Son, (who is his Wisdom,) and the co-equal Spirit,— the Three, One in essence,—the God to whom ye are the holy administering Spirits, thousands of thousands in number. Ye stand in his Court, ten thousand times a hundred thousand; and into this same, the King, the Father of the Word, brought the hundredth sheep, and the tenth groat, that they might share in your bliss. Ye in the high heavens, and we the elect flock on earth, give forth our tuneful praise on sweet-sounding harps. Thus, when united in the same eternal glory, may we sing together our Alleluia! How beautiful art thou, Michael, in thy heaven made armour, giving glory to the God, whose enemy thou overcamest! Thine humble and fervent eye is fixed on the throne of the Jehovah, whose rights thou defendedst, and who gave thee the victory. Thy sublime cry: “Who is like unto God?” roused the faithful legions, and became thy name and thy crown. It will remind us, for all eternity, of thy fidelity to our Creator, and thy triumph over the dragon. Meanwhile, we enjoy thy loving protection; we are thy happy clients. Guardian Angel of Holy Church! now is the time for thee to exert all the might of thine arm. Satan is furious in his efforts against the noble Spouse of thy Master; brandish thy bright sword, and give battle to this implacable enemy. The Kingdom of Christ is shaken to its very foundations. Rome is in danger of seeing the Vicar of Christ dethroned within her walls. Is it, that the reign of the Man of Sin is about to be proclaimed on the earth? Are we near that Last Day, when, this guilty world having been destroyed by fire, thou art to exercise, in the name of the Sovereign Judge, the terrible office of separating the goats from the sheep?—If this earth is still to exist; if the mission of the Church is not yet completed; is it not time for thee, O Michael! to show the Dragon of hell, that he may not, with impunity, insult on this earth the God who created it, who redeemed it, and whose name is King of kings, and Lord of lords? The torrent of error and crime is unceasingly dragging the world to the brink of the precipice; save it, O glorious Archangel, by confounding the dark plots, which are laid for its destruction! Thou, O Michael, art the Protector of our souls in their passage from time to eternity. During this present life, thine eye is upon our wants, and thine ear open to our prayers. Though awed by the brightness of thy glory, we love thee, dear Prince of heaven! and we live happy and contented beneath the shadow of thy wings. In a few days, or, at most, years, our holy Mother the Church, will be performing her last sacred rites over our lifeless remains; she will pray for us, to our Heavenly Father, that we may be delivered from the lion's mouth, and that the standard-bearer, St. Michael, may bring us into the holy light (Mass for the dead. The Offertory). Watch over us now, O holy Archangel, lest we should then not deserve thy protection. The Dragon is ever threatening us; he makes no secret of his wishing to devour us. Teach us, O Michael, to repeat thy beautiful words: “Who is like unto God?” God's honour, the rights he has over us, our obligation to be faithful to him, and serve him, and confess him as our Lord in all times and places,—oh, yes! the deep-rooted sentiment of all this must be our shield in our danger, and the armour wherewith, like thyself, we must fight and win the battle. But we want some of thy sturdy courage, which resulted from the love thou hadst within thee. Oh! pray for us, that we, too, may love this our common Lord and Master; then shall we be invincible. Satan cannot make head against a creature that is filled with the love of the great God. This God created thee, O Michael! and thou lovedst him as thy Creator; but as to us, he not only created, he redeemed us, yea and at the price of his own Blood! What, then, should be the intensity of our love for him! Strengthen this love in our hearts; and since we are fighting under thy leadership, guide us, inspirit us; let thy look give us courage; ward off from us the blows of the enemy's sword. We venture to hope that thou wilt be present at our last moments, O standard-bearer of our salvation! In return for our tender devotion towards thee, deign to keep guard round our death-bed, cover it with thy shield. If the Dragon see the flash of thy sword, he will not dare to come near us. May our soul, on leaving the body, throw herself with affection into thine arms! Cast her not from thee, O holy Archangel, when she seeks to cling to thee; carry her to the judgment-seat, cover her beneath thy wings, calm her fears; and oh! may the Lord, thy Master, bid thee bear her speedily to the kingdom of eternal bliss! Also Read – May 7, 8, 9, 2018: Rogation Days (Lesser Litanies). St. Michael Archangel, pray for us.